Millions of tourists from around the world flock to Ireland’s big attractions – Dublin (of course), the dramatic scenery of the Wild Atlantic Way, and Ireland’s Ancient East, with historic attractions like Medieval Kilkenny and Newgrange. But tourism chiefs have started to push a part of the country that’s largely undiscovered – even by us natives – and that’s the Midlands region. Exploring Ireland’s Hidden Heartlands, as the ‘new’ region is dubbed, really shouldn’t be a hard sell, with the River Shannon a playground for tourists, whether it be boating along its shores, or biking on the greenways that have sprouted up around the country. 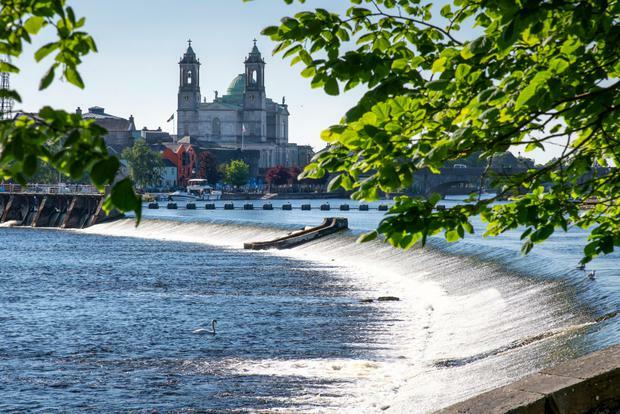 And as we rush from east to west in search of the perfect home holiday, it’s time to think about turning off the motorway and exploring the likes of Athlone. Visiting recently, it was busy with tourists – mostly from North America and the continent – but it’s got much to offer local visitors too. Built along the banks of the Shannon, it’s a strategic crossing that’s been around since at least the Bronze Age, and has been home to monks, Vikings, the Normans and was the site of one of the biggest battles of the Williamite War (1690, and all that). Our base was the town’s Hodson Bay Hotel, situated slap bang on the shores of Lough Ree. The phrase ‘something for everyone’ gets bandied about, but it’s definitely the case here. For smaller children, a kids’ club is available at the hotel, and there’s also bike hire. Something for everyone? As good as it is to see the kids occupied, adults don’t get left out. Grown-ups even have their own hotel-in-a-hotel, called the Retreat Wing. It’s where we stayed, and the room – well, enormous, with floor-to-ceiling glass with great views over the Lough below. The bathroom is as big as some hotel rooms I’ve stayed in, and the Jacuzzi bath is a luxurious touch. The Retreat Wing also has its own chilled-out bar area, which is a nice quiet retreat, but the main bar is a lively spot – with good local musicians playing at night – if you want something buzzier later on. Throw in the indoor pool and sauna/steam areas, complete with full spa, as well as outdoor hot tub, and it’s got all the must-have touches for an adult break. Right outside the front door, on the lough quay, the Viking Tours ship (above; vikingtoursireland.ie) makes its stop. Tickets are available at reception, and crew members Mike and George will give you a bit of local history, and some wildlife-spotting, as you take a gentle journey down the Shannon towards Athlone (and back later) on a Viking-style longboat, which reflects the area’s connections with the Scandinavian raiders (a hoard of their gold was found on nearby Hare Island back in the 1800s). More recent – but no less bloody – history is on show at the must-see Athlone Castle (below; athlonecastle.ie). Truth be told, I didn’t even know it had a castle, but this one has been around since the 12th century, and was the site of one of the fiercest battles in Irish history when Williamite forces besieged the Jacobite garrison in a bid to take control of the West of Ireland. It’s got tales of daring and despair, including the suicide mission of local hero Sergeant Custume, with all the main characters recreated using recycled materials. Hats off to those behind the visitor experience – it really does bring history to life for all ages, encouraging visitors to dress up in period costumes as the battle is recreated in an audiovisual theatre. The area tucked in behind Athlone Castle is steeped in history too – with Sean’s Bar (seansbar.ie) holding the Guinness World Record for being Ireland’s oldest pub. Dating back to 900AD, it’s now aiming to be named the world’s oldest, and no rivals have been found yet. And the bar’s Timmy Donovan (pictured below) says the history doesn’t end there, with the area laying good claim to being the original home of whiskey, with the science of distilling brought back from the Middle East (where it was used to make perfumes) by local Irish monks. The ‘uisce beatha’ was brought to the world’s attention as, much later, the troops of England’s King Henry II enjoyed the tipple so much they brought plenty home. Timmy, who’s also a well-known rowing coach, has launched a range of Sean’s Bar whiskeys using the old traditions used by the monks, and the drinks, like in the past, will be travelling the world, with the blends set to make their debut in the US. It’s worth popping in to the bar, by the banks of the Shannon, to grab a drink as countless generations have done before you. Across the river, you’ll find the bustling shopping streets, and Athlone Towncentre, with 60 brand-name stores. It’s ideally situated next to the boutique-style Sheraton Athlone Hotel (sheratonathlonehotel.com, where we stopped for some lunch in its bar, which offers a multinational menu (American burgers, Moroccan lamb, parmesan fries, Italian dishes and Irish seafood and cheeses). It’s easy to see why it’s bustling with locals and tourists alike. Truth be told, we barely scratched the surface of what’s on offer in the area – but will be back to try the cycling trails, the spectacular monastic site at nearby Clonmacnoise, and the local distillery in Kilbeggan. A weekend merely whets the appetite. Deals are good at the Hodson Bay Hotel (hodsonbayhotel.com). Overnight prices this summer start from €85 per room. For couples, relaxation packages start at €125pps for a night’s B&B, one evening meal, thermal spa experience and one express spa treatment. Family leisure breaks are available too, featuring kids’ camps, sailing, golf, bowling, archery, and more, plus there’s a range of offers aimed at the over-50s.